The controversy over whether Jesus and Mary Magdalene were married and had children began in our modern time after the release of the book Holy Blood, Holy Grail by Michael Baigent, Richard Leigh and Henry Lincoln in 1982. Although a work of fiction, the authors claim to have conducted extensive research and say there are many until now, hidden truths within it. The Catholic Church banned this book and the authors were maligned. Nevertheless, it was a best seller and got people thinking: could this be true? According to Sylvia Browne it is. She writes that Joseph of Arimathaea, who had tin mines in the British Isles (thus was quite wealthy), assisted Jesus in his escape after the ‘crucifixion’ by bribing Pilate. Browne says along with her own research, her guide, Francine, filled her in on what actually happened over 2,000 years ago. As well, Browne says she had her own visions and actually saw events of that time unfolding. More recently, Dan Brown’s The Da Vinci Code raised the issue of Jesus and Mary Magdalene again and scholars are frantically attempting to this day, to get at and uncover the truth. According to Browne the discoveries of the Nag Hammadi Gnostic writings (1945), the Dead Sea Scrolls (1947), the Apocryphon of John, the Sophia of Jesus Christ, the Act of Peter and the Gospel of Mary were vitally important, particularly since it became ever more clear that the Catholic Church picked and chose only those writings it felt reflected Jesus as the Son of God who died on the cross and Mary Magdalene as a prostitute to ensure Christ’s divinity. – and more importantly, the church’s hold on the masses through the guilt associated with good and evil. As well, the Old Testament portrays God as nasty and vengeful, while writings excluded portray Him as an all-loving Creator. At the Council of Nicaea in the early fourth century, which was presided over by emperor Constantine, this patriarchal group could not let a woman be seen as Jesus’ wife and most loved apostle. The Two Mary’s offers an entirely new perspective from Jesus and Mary Magdalene playing together as children, being wed at Cana (the wedding referred to in the Bible), and the escape of Jesus after the crucifixion with his mother, Mary, Joseph of Arimathaea and his wife, Mary Magdalene to Qumran. (Interestingly, Qumran means ‘heaven,’ so it was easy for those at the Council of Nicaea to claim Jesus went to heaven after his crucifixion.) Browne claims it was there that Magdalene became pregnant with their first child, Sarah. They then went on to Tyre where they set sail for what is known today as Turkey, then on to Greece, Italy, Egypt and then Britain. When they left Britain, they sailed to Marseille on the coast of France and eventually took up residence in a small town called Rennes-le-Chateau in the south of France. Jesus changed his name to David Albenguntun and they (primarily Magdalene) continued to spread the gospel. 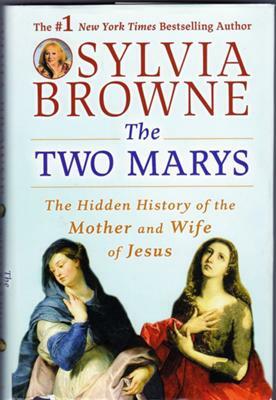 Basically, Browne portrays Mary, the mother of Jesus and Mary Magdalene as being very close, like mother and daughter. As well, they both learned and understood more of Jesus’ teachings than any of the disciples, and both has their own psychic and healing abilities. Magdalene had also done most of the teaching to the disciples, much to the chagrin of Peter, who replaced Magdalene in prominence and was portrayed by the church as its founding rock. The Two Marys follows on the heels of Sylvia Browne’s book The Mystical Life of Jesus. Although her version of the facts sound far too fantastic to believe, Browne says her guide has confirmed that eventually, all of this information will come to light as more and more discoveries of old writings are found. Whether this will occur remains to be seen.